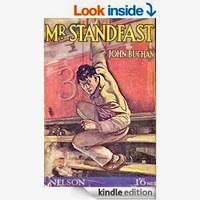 "Mr Standfast" is a book written about events around the first world war by a man who was obviously there. It is one of a series of novels written about Richard Hannay of which the best known is "The Thirty Nine Steps". In this book Hannay is an officer in the trenches in France who is asked to do undercover work with concientious objectors to find a German spy. The story ranges from the French trenches to industrial England, rural Scotland and then to Switzerland before returning to the war.